Each academic year since 2003, Reinhardt has designated a region of the world for students to learn more about through in-depth study and hands-on interaction. This focus is intended to promote understanding of varied cultures, businesses, histories, geographies and faiths and to help internationalize the Reinhardt experience. The 2015-2016 year was the Year of Mexico. Students experienced and learned about our neighbor to the south and how our intertwined histories have created our current relationship. Events were scheduled throughout the academic year and included a festival, lectures, Day of the Dead celebrations, an immigration symposium, a travel tour, and many others. 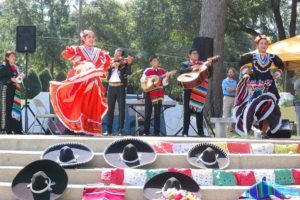 Year of Mexico Festival – 11 a.m. – 2 p.m. Donor Plaza (weather permitting); all proceeds from the event will help fund the construction of a well in El Tablon in Mexico. all festival long - food, games, school booths, a marketplace and chances to take a swing at a real piñata. Between 12-2p.m.- Address by Ascary Arias: For the Year of Mexico we are focusing on raising funds to get a well for the 700 families of El Tablon in Mexico. To spread the word about the project and what we are doing, the President of Vidas de Esperanza Ascary Arias is heading out on a 24-hour 380-mile bike and will arrive approx. between 12-2 p.m. at the festival. He will be the featured speaker for the event.